Is in Lexington Kentucky the last Sat in July. SGGAinfo.com will give you more info as it gets closer. The Hostess is Nancy Ford!! It will be a great time! If you have never been to an SGGA I encourage you to go, learn, make friends, and have fun. You will want to stay from at least wed or Thurs. until Sunday. Its a great old war city with lots of cool stuff to see. I have our room booked, are you coming this year Cora? The SGGA is now only 7 weeks away! The logo has been chosen. Shirts and other SGGA items will soon be available to order on Café Press. 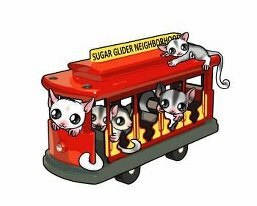 Trina Finch is planning our Friday Night Welcome Party on behalf of Sugar Glider Fanatics. I can’t wait to see what she has planned! Vending is full. There are some vendors who have registered but not yet paid for their table. The space is not guaranteed until paid, and I am making those spaces available on a first-come, first-paid basis. Lunch is not included in your registration. The hotel has offered a limited menu for those who would like to be served in the main conference room. The menu includes soups, salads, hot and cold sandwiches, burgers and fish, all at $8 or less. The menus will be available on the conference room tables, to be completed and turned in by 10am or the time given to us by the hotel restaurant. Lunch will be an hour and 15 minutes. You are welcome to go out to eat or make other plans, but we will start promptly after lunch. Donations are coming in. I would like to give a huge “Thank You!” to our generous vendors. There is still plenty of time to donate. Please contact Melissa Cowles for any questions about donations. Lucy Letton is working on discounted tickets for things to do in and around Lexington. Some options may be the Kentucky Horse Park, Natural Bridge State Park, Red River Gorge, amusement parks and more. Speakers, demos, the sewing/craft room and kids’ activities are coming along nicely. We have almost 70 registered so far. This is going to be an awesome weekend. I am looking forward to meeting all of our new glider owners and to see my glider buddies! 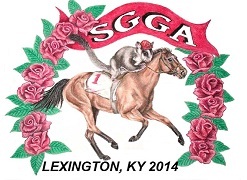 Are you ready to order your SGGA 2014 t-shirts, car magnets, jewelry and other goodies? CafePress has been updated and here is the link to order: http://www.cafepress.com/sgga Please contact us by email to sgga@sgga.info if you would like a special order of an item or design that is not listed. Ty Nancy!! Just cause I can't come doesn't mean I cant get a t-shirt, you rock!!! You will be missed, Cora. I sent you a message earlier, but wanted to send out a huge here for the SGN t-shirts you sent on behalf of SGN. The SGGA is only 3-1/2 weeks off! It will be here before you know it. We have received some amazing donations so far. Thank you so very much to our vendors for their generosity! There is still time to ship your donation to me or you are welcome to bring it with you to the SGGA to save on shipping. Gift certificates are also a last-minute option. - Book your hotel room. Our room block and rate are guaranteed only through July 12th, which is next Saturday. The best way to reserve a room is to call the hotel directly at 859-299-1261 and ask for the SGGA room rate. I can't wait to welcome you to Kentucky! » Léo - Futur ES 2013/2014 ?